(Nanowerk News) With the aid of this minimal model, the researchers were able to take a closer look at the biophysical mechanisms involved. “Our model may help to develop and test new treatments for diseases caused by errors in cell division,” said Sven Vogel, scientist at the MPI of Biochemistry. 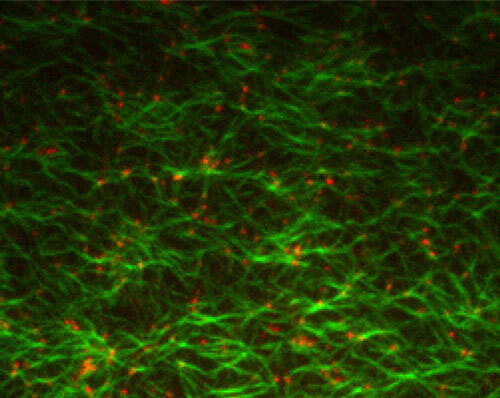 The results have now been published in the journal eLife ("Myosin motors fragment and compact membrane-bound actin filaments"). The researchers of the department Cellular and Molecular Biophysics try to remodel the structures of a cell with the help of a modular approach. Their aim is to observe and visualize step by step the underlying mechanisms of living systems. “Our vision is to assemble more and more building blocks of natural and synthetic biomolecules until we finally have the minimal version of a cell in front of us,” said Petra Schwille, director at the MPI of Biochemistry. Using such an approach, the scientists have now succeeded in investigating the process of cell division in greater detail. During cell division both the genetic information and the cell plasma must be distributed correctly to the two daughter cells. Moreover, the two newly created cells must be separated physically from each other. An important component of this cell division machinery is the cell cortex. This layer is located directly below the cell membrane and consists of a thin layer of thread-like protein chains, so-called actin filaments. During the actual division process, myosin motors from the interior of the cell exert force on the actin filaments, causing the cell cortex to constrict in the middle and ultimately to divide.